Many of you already know that after working hard on building a feature-rich and awesome-looking website, you’re not done. The next step is to convert your visitors into leads for your business. 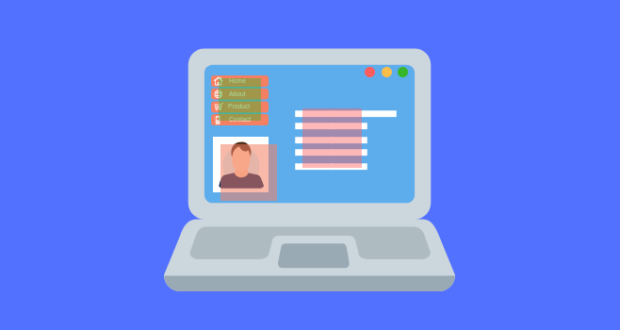 Even though there are different ways to present and offer your services or products, landing pages are a proven way to do that. In order to build a landing page that leads to more sales, you need to have a good toolset. 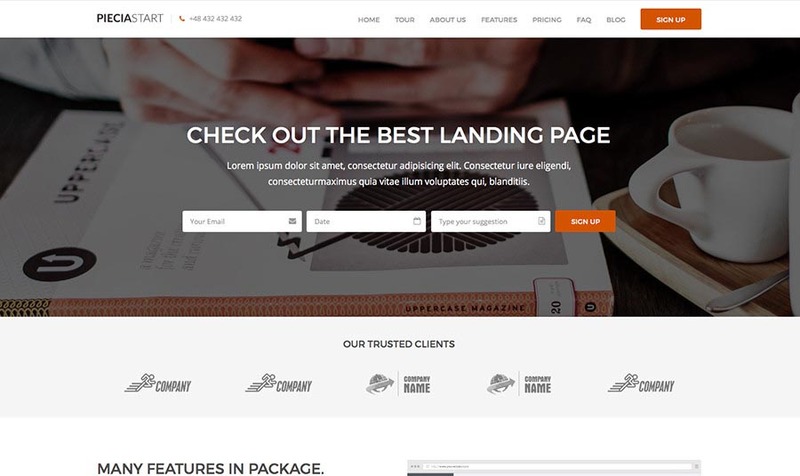 However, before taking a look at some of the most interesting landing page WordPress themes, let’s take a look at what makes a good landing page. 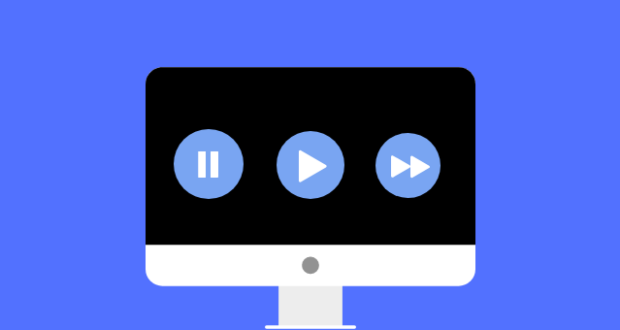 For example, using videos can increase conversation by 86%. Still, this doesn’t mean that you should add lots of animations and videos since even a 1-second delay in your site speed results in a 7% reduction in conversions. On the other hand, it is advisable to have multiple landing pages for different products. Companies who build 10 to 15 landing pages see an increase of 55% in leads and companies with more than 40 landing pages get 12 times more leads than those with 5 or less. This gives you a brief idea of how important landing pages actually are. 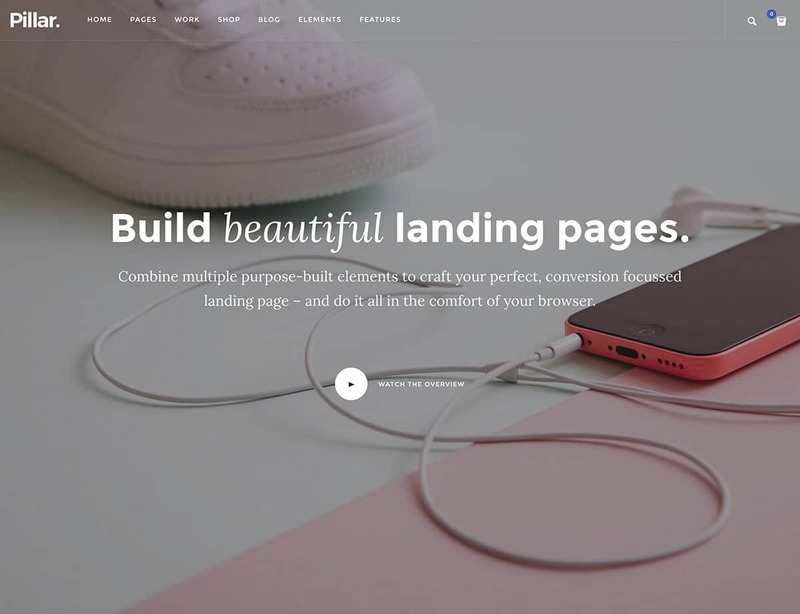 Now, let’s check out some of the best landing page WordPress themes. We will be taking a look at their most interesting features, as well as other tools they use to help you score more sales. Jevelin is a modern WordPress theme built on Twitter’s own Bootstrap. This is a lightweight framework that ensures high performance, clean-cut design, and a high level of flexibility. 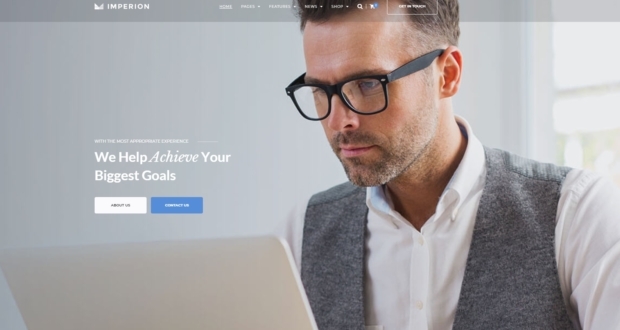 One of the biggest benefits of Jevelin is that you can build your entire site using this theme as well as your landing pages, making sure that your website’s design is uniform. 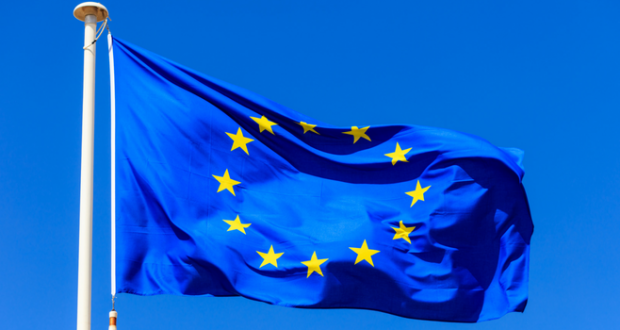 What also needs to be highlighted is that Jevelin offers several tools for online marketing. Some of these are coupons, advertising campaigns, as well as online forms (including online payment systems). Even with all of these advanced features, you don’t have to be a web designer to use them. Thanks to its drag-and-drop builder, you can easily combine different visual and functional elements into something great. If you are looking for an easy-to-use landing page WordPress theme that also looks modern, try Uncode. Preloaded with widgets, visual elements, as well as fully-functional demos, all you have to do is to combine those elements using the Visual Composer tool. In order to customize a preloaded layout (or even to create one from scratch), all you need to do is to pick a page element and drag it across the screen. Each of the preloaded elements is fully customizable, so you can avoid creating a generic landing page. 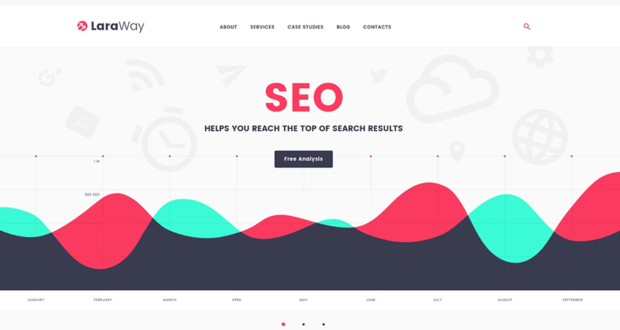 Uncode comes with a lightweight code which is an important SEO prerequisite. The theme’s performance is amazing, with drastically reduced loading times. Even if you want to add a bunch of animations, you can choose from a number of CSS3 animations that come preloaded. 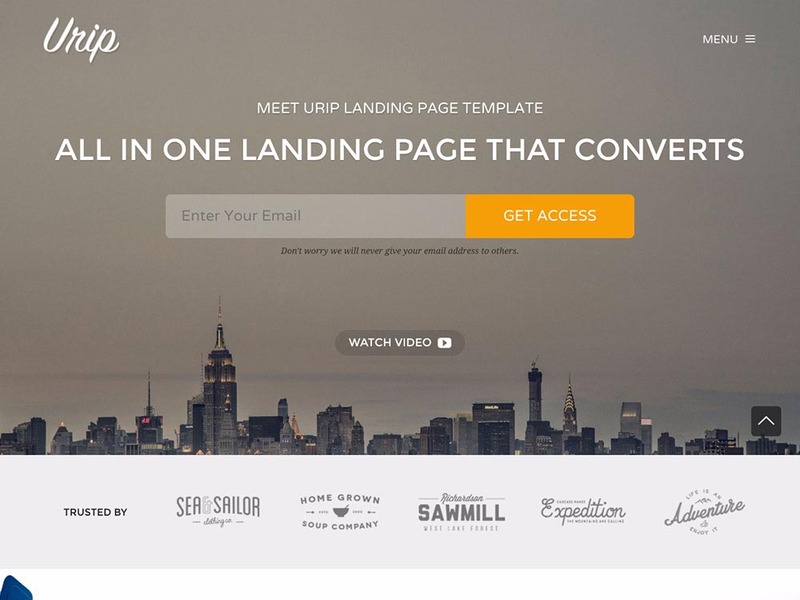 Uncode can be used with just about any kind of a landing page. 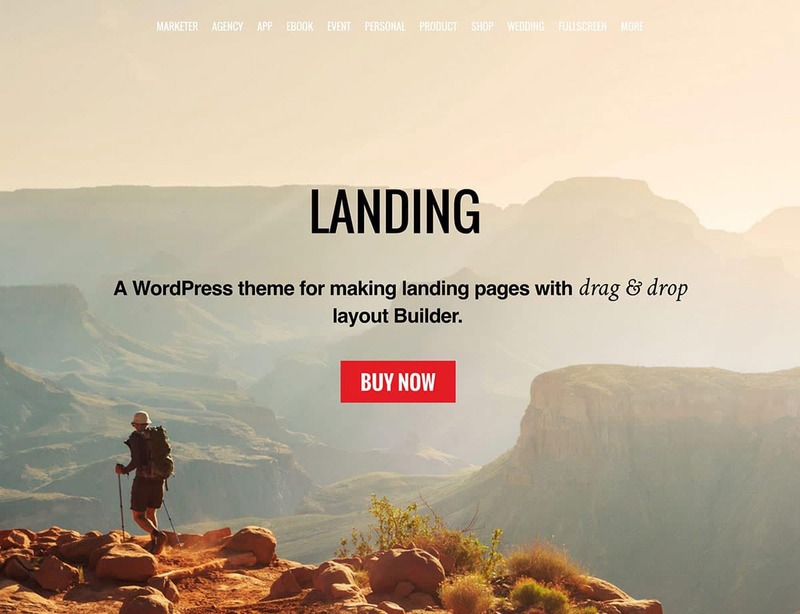 Landing is a specialized WordPress theme that showcases full-screen media and a scrolling parallax effect. Even though this isn’t something new, these features really pop out thanks to the Landing theme. 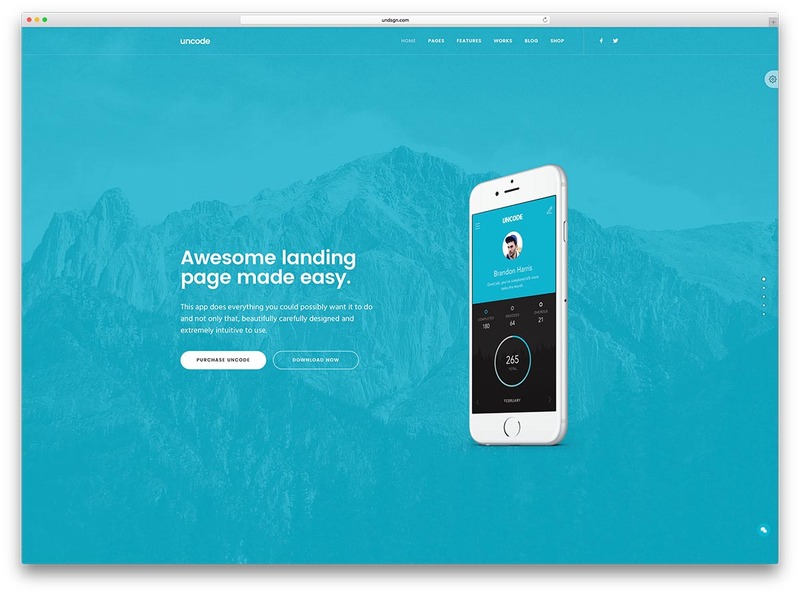 Built for an average WordPress user (and not for a web developer), Landing is powered by an easy to use drag-and-drop page builder. To make things even easier, you can choose from a number of awesomely-designed demo pages. Import a demo page, and replace the text and placeholder media – and you’re ready to go! Landing can be used for products, apps, eBooks, online shops, or even as your personal page. 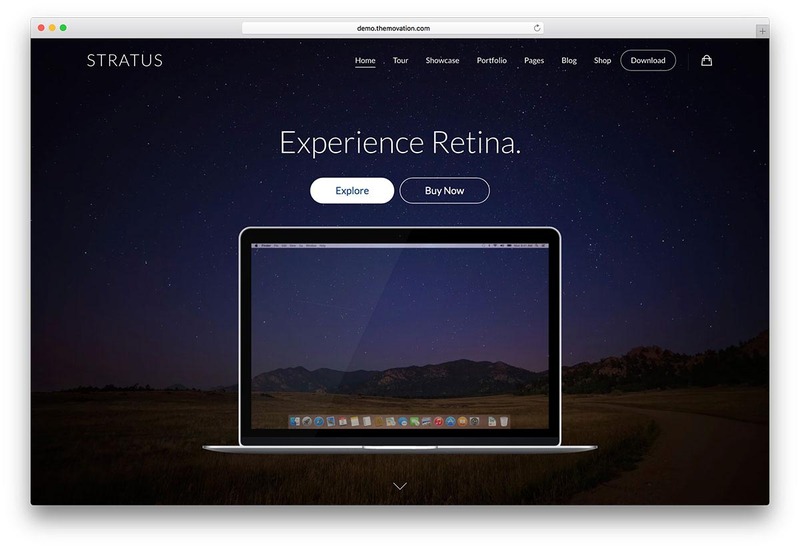 Marketed as the ultimate landing page WordPress theme, Stratus is packed with interesting features. However, this theme works best for App and SaaS companies. Upon entering a dashboard admin panel, you will be blown away by the number of options and customizable features. This theme allows you to create fully responsive landing pages that use full-width or boxed layouts. Pick either a sticky or transparent header and customize a full-width slider underneath the header. This is possible thanks to the bundled Master Slider Pro. Stratus also brings the Formidable Forms plugin, which packs a number of fully functional forms. This is one of the best Landing Page WordPress Themes. Leadx comes with five incredibly attractive demos to get you started. Each of those five demos is designed to showcase a different kind of sales funnel. If you don’t have a lot of time on your hands, Leadx seems like a very interesting solution. Installing one of the demos takes less than one minute, leaving you the job of uploading your text and images. If you want to design a landing page from scratch using Leadx, you can count on different preloaded elements. These are Google Maps integration, progress bars, and buttons. Additionally, the free Contact Form 7 comes bundled for those of you who don’t need a premium form WordPress plugin. 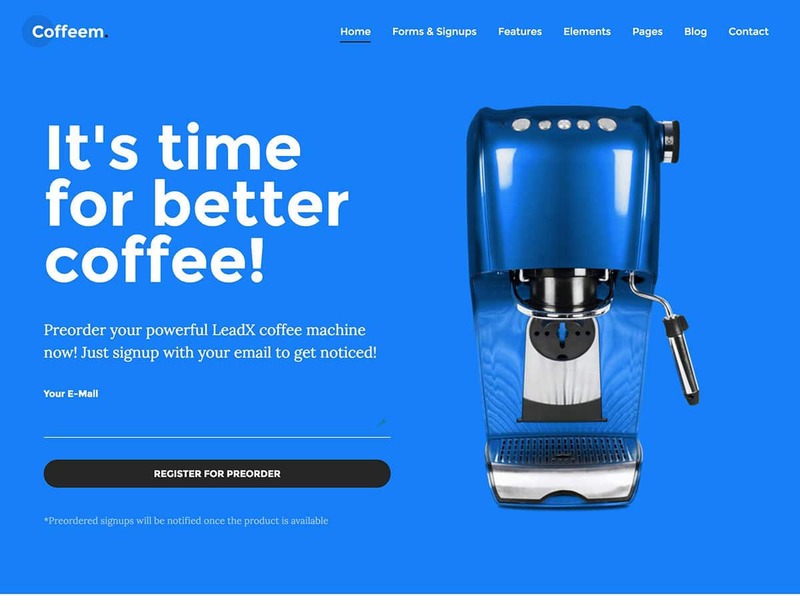 If you don’t have a lot of knowledge or time to build your own landing page from scratch, Leadx could be the theme for you. Piecia is a modern one-page landing page, designed to work well for multiple industries. It doesn’t come with other plugins and extras, which might seem a bit surprising at first. However, Piecia is designed for performance (which is great for SEO). 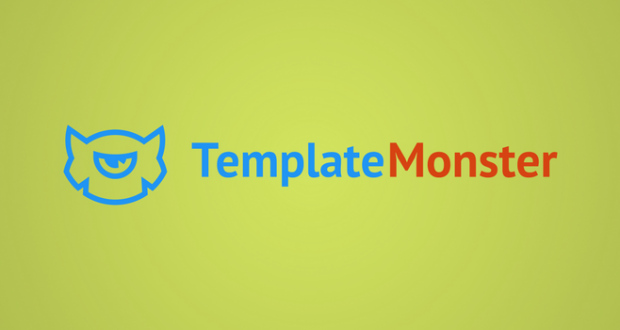 You will get to pick from six predefined layouts with different call-to-action layouts. Using its CSS editor, you can customize this theme even further and set it the way you want. Among some of the customizable features, you can find Font Awesome icons, Google fonts, pricing tables, FAQ sections, Mailchimp, and one-click data important. Needless to say, Piecia is fully responsible and multi-lingual as well. 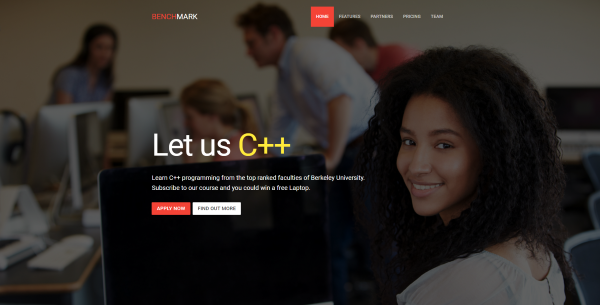 Benchmark is a one-page landing page WordPress theme with preloaded and customizable elements. These include two body layouts, nine hero layouts, three navigation bar layouts, and thirteen color schemes. Just like the majority of landing page themes, Benchmark is powered by its own web page builder. This one is using the SiteOrigin Panel, which offers drag-and-drop functionality. Other features include mega menus with graphics, use of shortcodes, Google fonts, and parallax backgrounds. 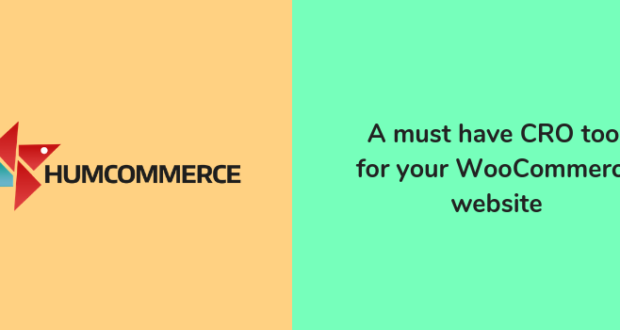 In order to help you convert visitors into buyers, you can use the WooCommerce plugin and sell you services or products by using your website. With more than 50 modern looking demos, Massive Dynamic stands out as one of the graphically polished themes. Thanks to its variety of demos, this theme can be used for almost kind of a website. Massive Dynamic comes with numerous tools and features that can be used “out of the box”. However, one of the most interesting features is its drag-and-drop builder. This isn’t like any other builder since it offers a real-time interface to preview the end result. This ensures that you have the full control over the UI every step of the way. When it comes to landing pages, you can use different kinds of call-to-action elements. This also works well with WordPress forms, so you can offer your visitors everything they need to finalize the purchase. 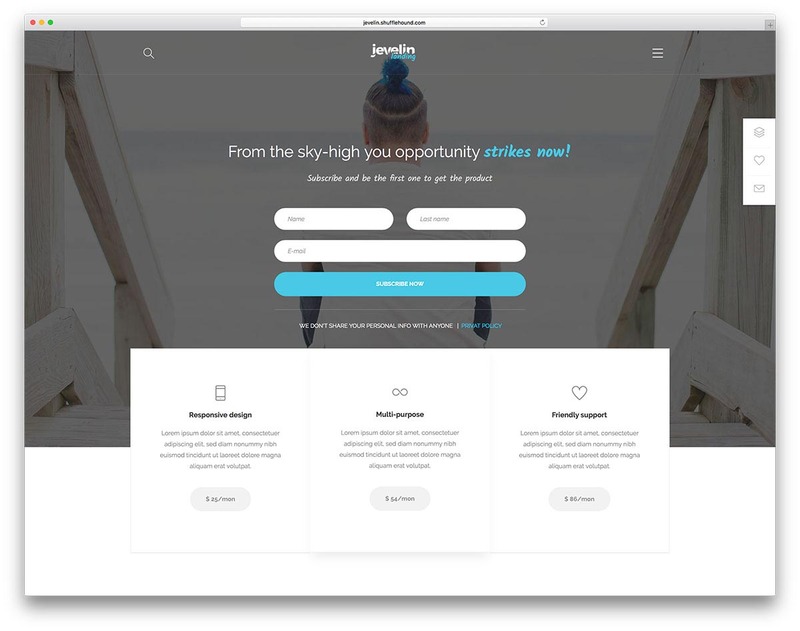 Massive Dynamic brings an amazing depth of customization, which is why you probably can’t find two Massive Dynamic landing pages that look exactly the same. On top of that, your landing page will be awesomely designed and fully functional without spending a lot of time on working on it. It’s one of the coolest Landing Page WordPress Themes. The Gem stands out thanks to its predefined demo layouts. These demos bring a traditionally designed landing pages, as well as modern landing pages whose elements seem intertwined. This is something that’s very hard to achieve using WordPress. Every step of the way during your design, you will have several options to choose from. The Gem offers the Slider Revolution plugin that makes great sliders. In addition, you can use LayerSlider or NivoSlider as well. You can even combine these different slider engines in an innovative way. 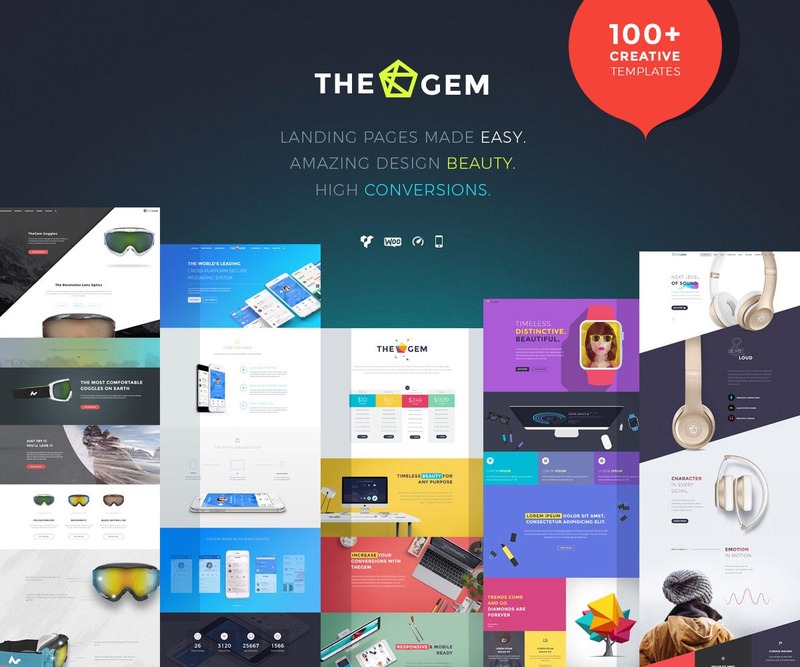 The Gem comes with 150 demo templates, which is more than enough to get you started. If you can’t find a suitable template for your need (which isn’t likely to happen), you can use the Visual Composer to build your landing page from scratch. Designed for versatility in mind, LaunchKit can be used by companies and individuals, from agencies to personal blogs. This kind of versatility is shown through the theme’s demo pages, ready to be imported in a second. Supported by the Visual Composer builder, LaunchKit allows you control both header and footer, in addition to full control over the rest of your landing page. There are three headers and seven footers to choose from, as well as fifty content blocks. It is up to you to combine these content blocks into something unique, which is done by dragging and dropping those elements within the Visual Composer. Pillar showcases different niche services through its demo templates, even though this landing page WordPress theme is actually a multipurpose theme. You can use it for listings, products, and services. Those of you who like modern and minimalist design will find this theme to be highly interesting. Thanks to its chic backdrop and lots of customizable elements, you can create both minimalistic pages and very busy landing pages as well. There are 110 demos to choose from, which can be imported using the one-click installer. The Visual Composer is there as well, to edit demos or create pages from scratch. Pillar comes with SEO tools, helping you achieve a better SEO ranking. In addition, there are online WordPress forms, over 2,000 premium fonts, and it even integrated MailChimp support. 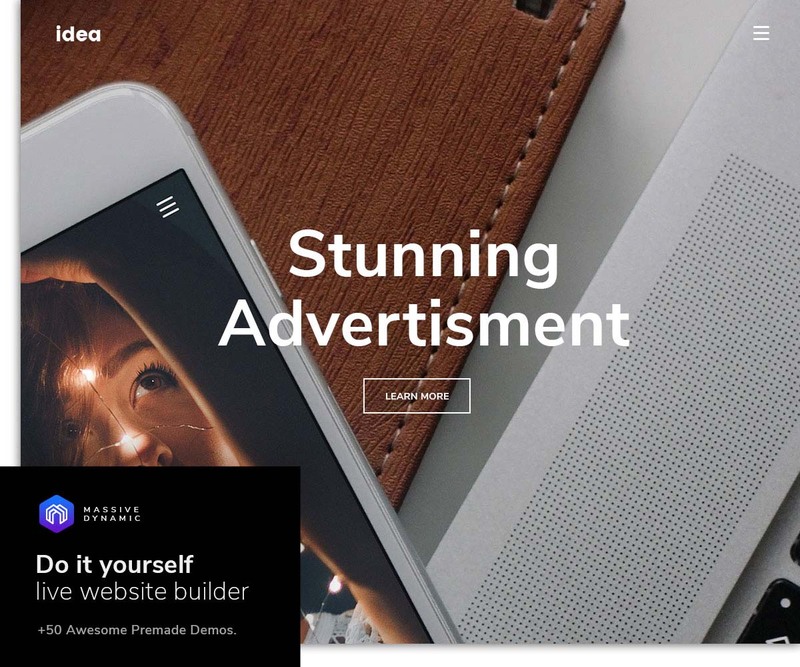 Urip’s developer, Ninetheme, wants you to create an effective and modern-looking landing page without much fuss. This is why the developer offers very thorough video tutorials and extensive documentation. Thanks to the tutorials, you can create uniquely designed landing pages using WordPress the framework this theme provides. There are 15 content sections to choose from, including carousels, galleries, testimonials, and call-to-action elements. All of these come with shortcodes, so you can use them almost anywhere within your design. This is more than enough if you’re looking to create clean-cut landing pages without much fuss, which turn your visitors into leads. 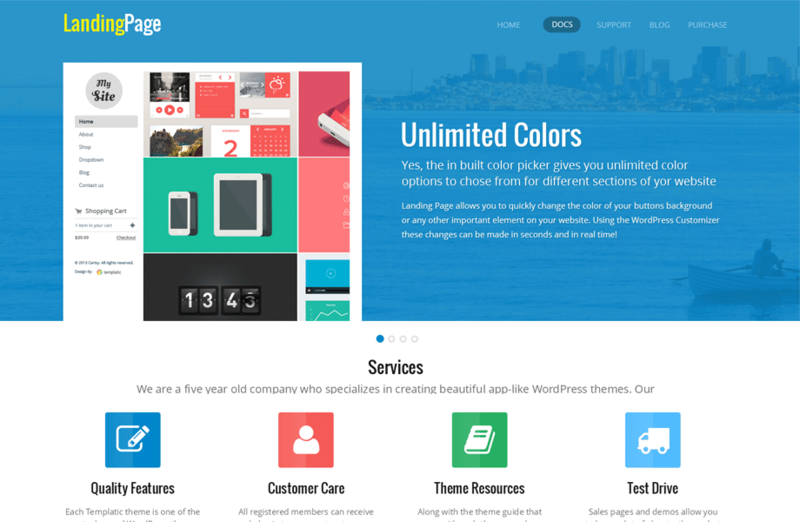 Designed to serve as a portfolio landing page, LandingPage is a one-page WordPress template. It showcases different products in modular fashion, and it does that thanks to its extensive portfolio features. You can count on unlimited color options, wonderful mega menus, and different content building blocks. There is even and HTML slider that produces nicely looking sliders without being heavy on a website’s performance. Those looking for a deep customization level should know that LandingPage comes with PSD files included. This means that with some help from a web developer, you can create your own uniquely designed landing page. 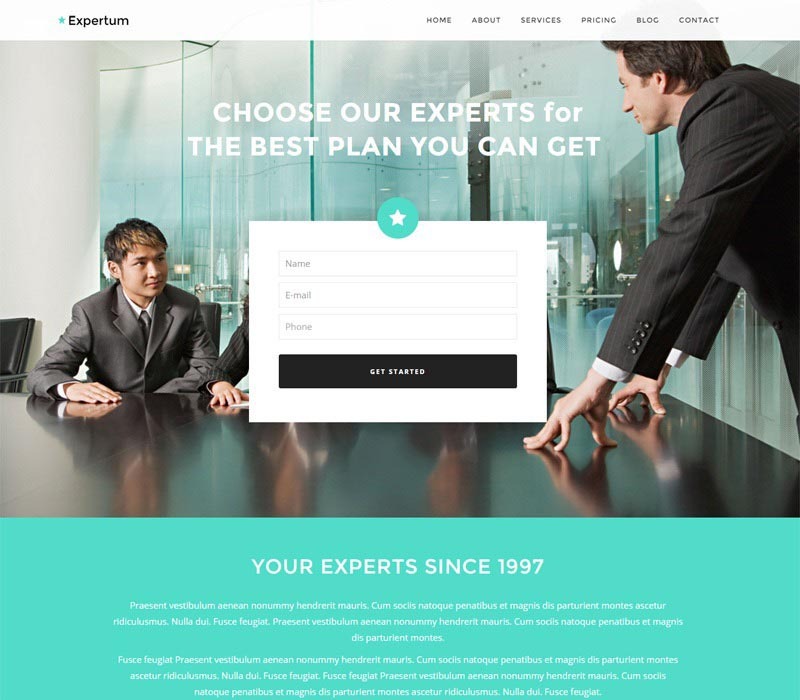 Expertum landing page WordPress themes is designed for businesses and marketing firms who want to showcase their products or services. 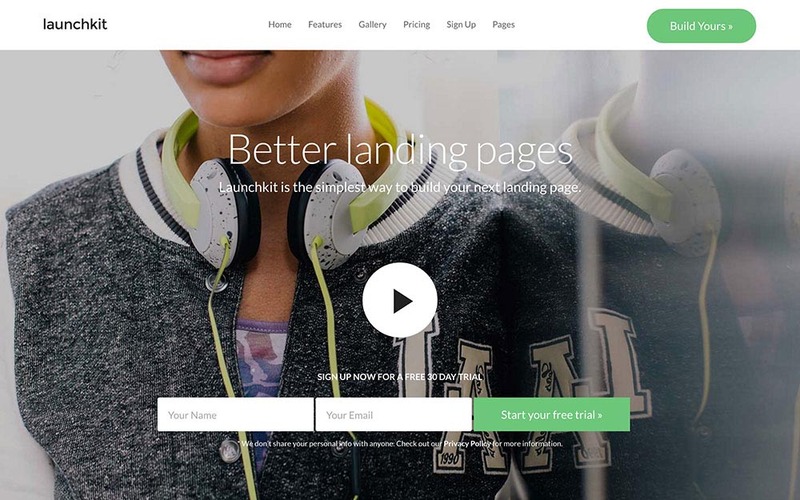 Designed for those users in mind, this landing page WordPress theme lets you get started fast. 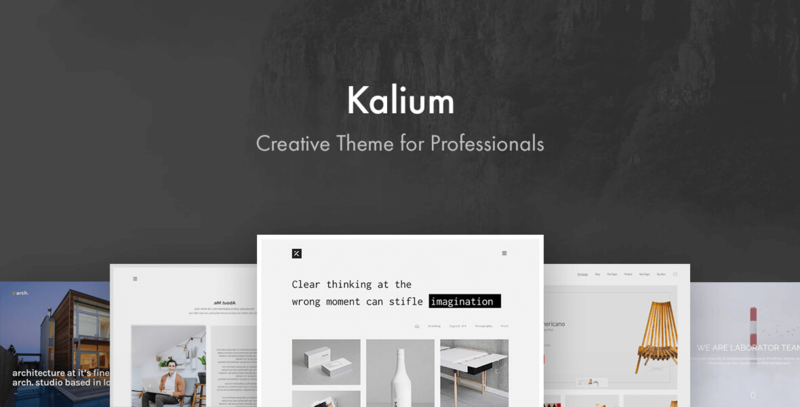 This theme includes animations, timelines, parallax, sliders, counters, videos backgrounds, and even portfolio elements. Using the drag-and-drop builder, you can combine themes and create your own landing page. There are no limitations to your design, and you have unlimited colors, layouts, and sections. Unlimited skin colors, layouts, sections etc. 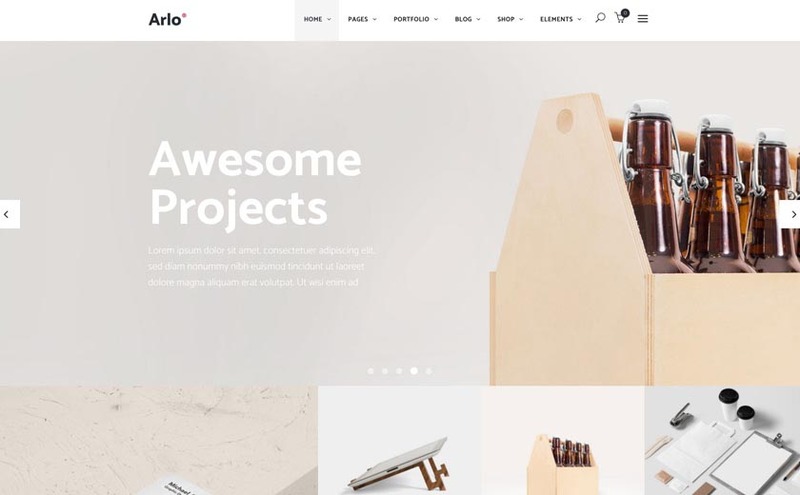 Arlo is a multipurpose landing page WordPress theme that showcases its best use through its demo content. It allows you to build not only landing pages, but also full-featured websites. With this kind of a uniform design, you can create a stunning visual concept and execute it throughout your website. When it comes to a landing page, there is a number of one-page layouts available. Different content sections are there at your disposal as well as shortcodes for additional design tweaks. These include counters, animations, Google Maps, and other interactive elements. There is a range of smooth and impressive-looking animations that showcase your products. Designed to look chic and youthful, Kalium brings striking and bright colors. Using this theme, you can not only create your landing page, but also other pages that showcase different aspects of your offer. The Visual Composer, LayerSlider, and Revolution Slider are there to power different content blocks and striking animations. The WooCommerce can is used to turn your landing page into an online shop. Still, the theme has a lightweight code and can achieve great performance without sacrificing its good looks. 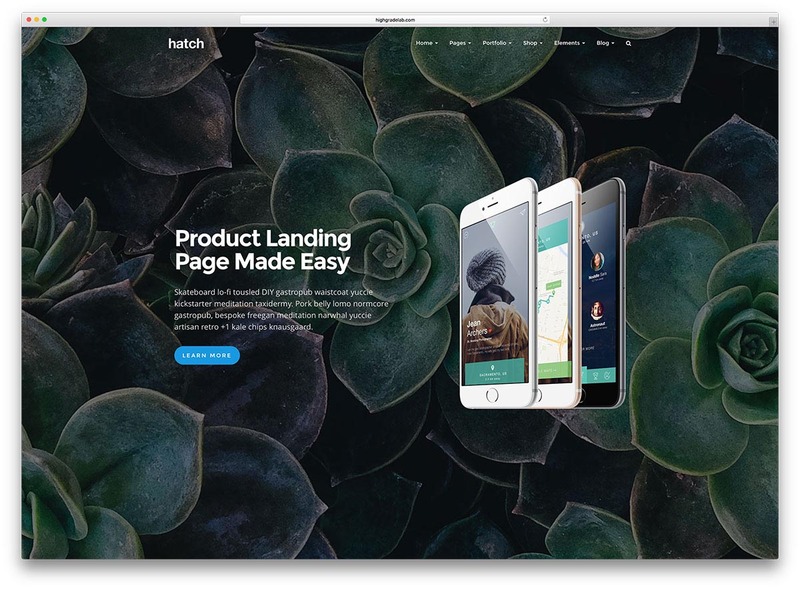 Hatch is designed for those who don’t have a lot of WordPress experience but who still want a modern looking landing page. If you take a look at its demo pages, you will see that Hatch is incredibly elegant and sophisticated, while being responsive at the same time. 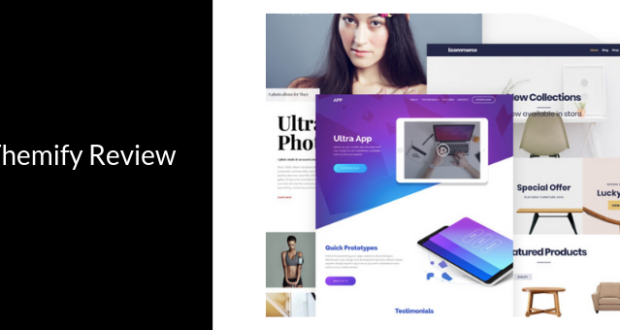 The amazing Revolution Slider is included for dynamic graphic elements, as the impressive Essential Grid that provides unique content layouts. Thanks to these versatile features, Hatch can be used to showcase mobile applications, books, as well as other kinds of digital services. Its features makes it one of the best Landing Page WordPress Theme. We hope that we helped you find the best possible landing page for your WordPress-based website. 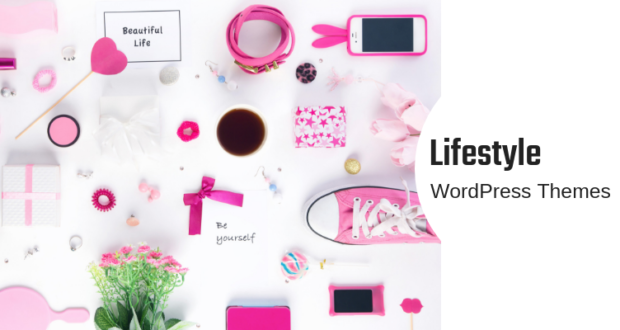 As you can see, there are thousands of landing page WordPress themes available, so reading an article like this one should be an important step in your research. In case you’d like to share additional landing page templates and perhaps show us some hidden gems, feel free to post a comment.